News – BP or not BP? The British Museum Stolen Goods Tour Returns on May 4th! The Indigenous Australian campaigner Rodney Kelly is coming back to the UK – and we’ll be joining him once again in the British Museum to call for the return of his ancestral shield and an end to BP sponsorship. Back in December, Rodney was joined by speakers from other communities with stolen artefacts in the … More The British Museum Stolen Goods Tour Returns on May 4th! Leave a comment The British Museum Stolen Goods Tour Returns on May 4th! NO WAR, NO WARMING: join our mass takeover of the British Museum! 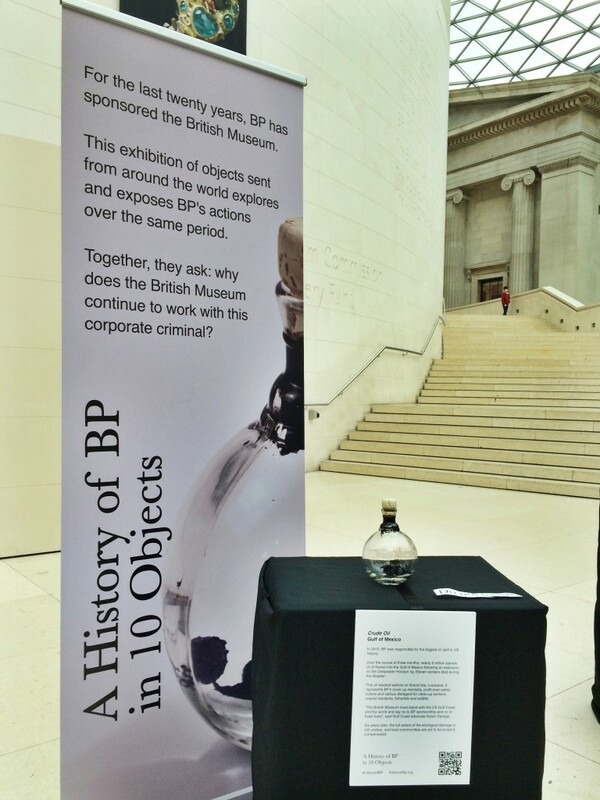 ****SATURDAY 16TH FEBRUARY 2019, 2PM, BRITISH MUSEUM**** A blockbuster exhibition with stolen ancient Iraqi objects on display – sponsored by the oil giant BP? We won’t let the British Museum clean up the image of this war-profiteering, climate-crashing company, while glossing over its own problematic past! 16 years after massive protests took place around the … More NO WAR, NO WARMING: join our mass takeover of the British Museum! Leave a comment NO WAR, NO WARMING: join our mass takeover of the British Museum! Join the unofficial British Museum “Stolen Goods” tour on December 8th! December 8th 2018, 2pm, British Museum A completely unofficial tour of the British Museum with Indigenous Australian campaigner Rodney Kelly and other speakers (tbc). Next Saturday, December 8th, at 2pm, join Rodney Kelly and other speakers for an unofficial tour of the British Museum’s stolen goods and its controversial oil sponsor. The museum is coming … More Join the unofficial British Museum “Stolen Goods” tour on December 8th! Leave a comment Join the unofficial British Museum “Stolen Goods” tour on December 8th!